RUMFORD — Several people cautioned the Land Use Planning Commission on Tuesday evening to carefully consider plans to rebuild Middle Dam on Lower Richardson Lake in northern Oxford County. The five-year project is being undertaken to meet Federal Energy Regulatory Commission requirements, according to Samantha Edwards of Brookfield White Pine Hydro. The company owns the dam at the outlet of the Rapid River in Township C.
Betsy Ham, whose father was the dam keeper for many years, also urged caution with the project. 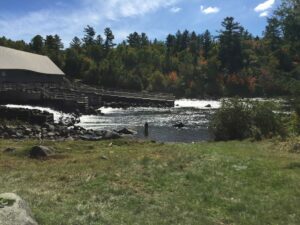 Ham of Bowdoinham said the permit to rebuild Middle Dam should “fully restore the working area with native plants” and use limited exposed riprap along the shoreline, and include a “living shoreline” with vegetated riprap. Edwards noted the company’s work to prevent smallmouth bass migration in the area.